I know you’re all probably sick of hearing about my broken Kindle. Poor me. 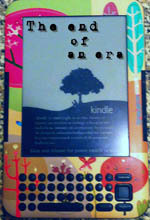 But, I’ve found solace in choosing just how to make my new Kindle my own. However, because I am not a rich person who can drop a bundle on a new Kindle (coming this week!) and a bunch of accessories, I have a plan. Order a divine Kindle Paperwhite with special offers. Done, baby. Buy a two year protection plan within 30 days of purchase. Because, hello? I like to drop my Kindle. Or, in the case of my last Kindle, forget where I put it and kick it off the bed. Got this done before the 30 day window closed. I MUST have protection. Order a case. Did you see the case? It has the names of my favorite heroines, most notably Elizabeth Bennet and Holly Golightly. *sigh* Here’s something sad: I forgot all about the case. Forgot. So, when I went to buy it, they’re no longer in stock for a Paperwhite. However, I just purchased a Kindle Fire (for tableting, not reading) and I was able to get this case for that. I’ve decided I’d prefer an envelope case for my Paperwhite, because I want to see my skin and I like to hold the Paperwhite to read–with nothing extra weighing it down. Finally, pay the extra $20 to get those special offers to go away. I’m using my daughter’s Kindle now, and hers has the special offers. They don’t in any way interfere with the reading and they’re not hideous on the sleep screen. It’s just… I’ve really become attached to my literary portraits. When I turn my Kindle off and see a portrait of Jane Austen or some other incredible writer, I’m inspired. I don’t know if I’ll ever do this. I don’t mind the ads. I’ve bought books and the aforementioned Kindle Fire because of ads I’ve seen. I know this new Kindle will bring me (at least two) years of reading joy. And that, my friends, is how you finance a perfectly personal e-reading experience. Now, who wants to tell my husband about all this? I’ll tell him! Because you’re an awesome person and deserve the best possible, most rewarding reading experience ever. Now I am also tempted to spend on some fancy Kindle cover that screams me. I’ll need one with Superheros though. I wonder if they have those cute skins for my Nook Tablet? I imagine they would. Check out Decalgirl’s skins, if they have them. My last skin and the Paris one were made by them. I can tell you, the one for my Kindle Keyboard (all those little keys!) fit perfectly and NEVER shifted, became unsticky, anything. Just checked the site. They do!